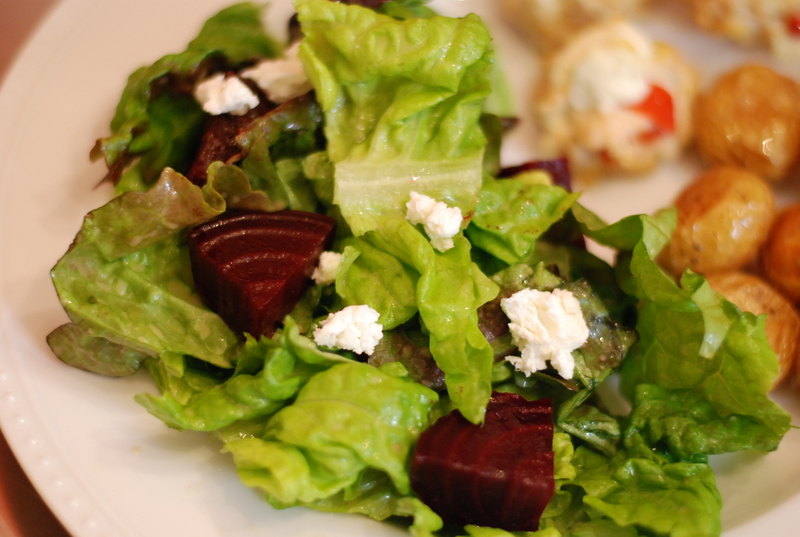 roasted beet salad with goat cheese and honey dijon vinaigrette. I’ve declared this “Foods Tina Hates Week” on The Dough Will Rise Again, and I thought there could be no better way to kick it off than with a roasted beet salad. Now, I know Tina’s not the only one out there that thinks beets are an abomination (Matt also thinks this) but I love, love, love beets. Up until last weekend though, I had never even attempted to deal with beets on my own. Which is a shame, because they are incredibly easy to make, purple hands aside. Beet haters, don’t close your browser just yet though, as the dressing for this salad is a keeper – with or without beet accompaniment. First, you’re going to want to make your beets. Wash and scrub beets, and trim stem down to 1/2 inch. 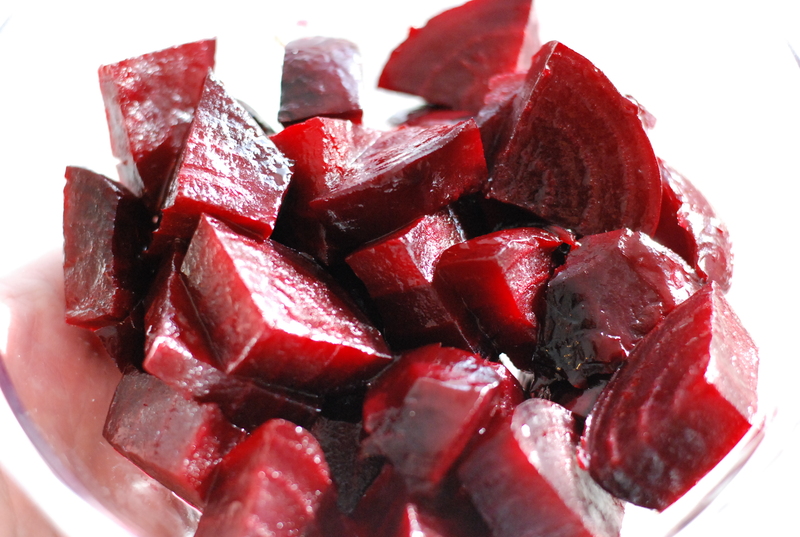 Place beets in foil, douse in olive oil and place in oven to bake for an hour. Beets are done when skin is easily pierced with a knife. Unwrap foil to let beets cool until you can handle them. Peel skin with a paring knife, and chop beets to desired size. (I recommend cutting directly on the foil, lest your cutting board be forever stained bright red.) Refrigerate until you’re ready to assemble your salad. For the dressing, combine all ingredients in a mason jar, shake to combine. Refrigerate until supper time. To assemble salad, place greens in your salad bowl and add dressing. Toss to combine. Top with beets, goat cheese and nuts, if desired. Just got beets in our farm share this week, so I came looking for this recipe! Beets are roasting now! Welp, the dressing was a hit. Beets tasted okay…kind of like dirt though?